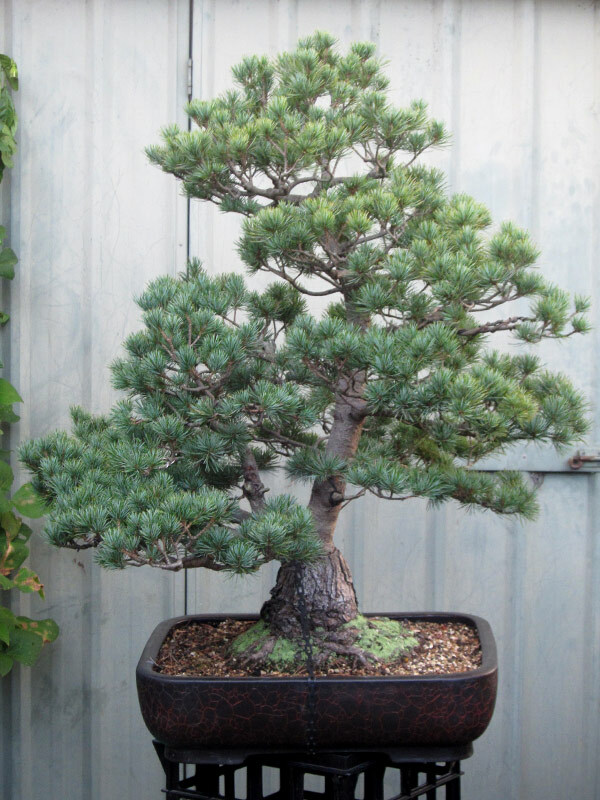 Prior to the recent AABC convention, I was asked to style an established Japanese white pine that had reached a stage where it needed some work to get it back on track. 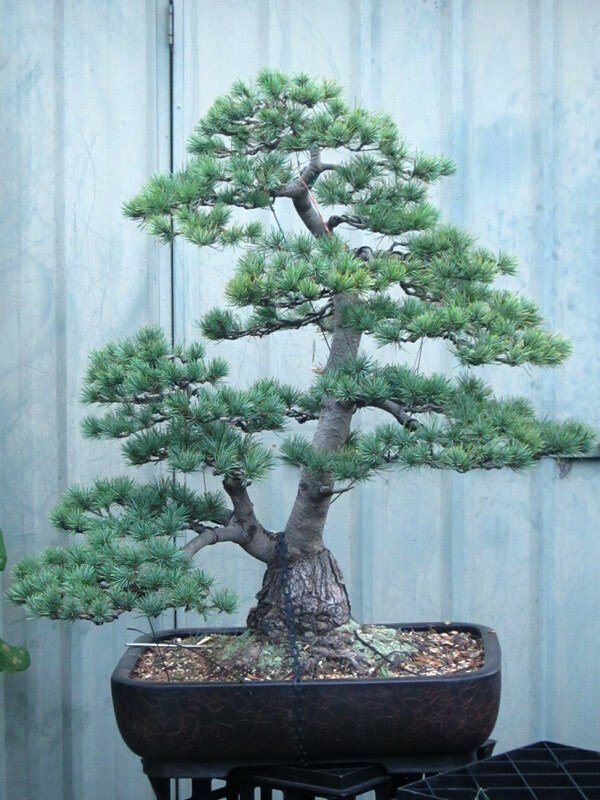 It had been worked on a number of years ago during a workshop held by Hirotoshi Saito where the second trunk was bent upwards from what was a heavy first branch. Since then the tree has grown out with the occasional branch guyed down from time to time and with some trimming to keep the growth somewhat compact. What the tree was desperately needing was a full wiring and styling. As the tree arrived in my garden. I cut a good amount of branches off and had to do some heavy bending to move the apex from leaning towards the back to leaning forward. Most of the work was sorting out branch structure and setting basic branch positions to prevent thickening in areas that you might not want it in the future and providing structure for the tree to grow into. 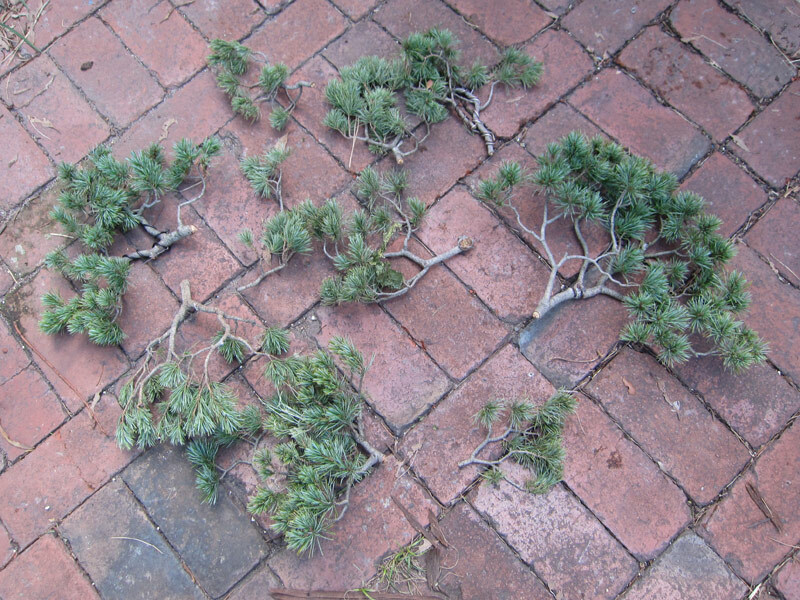 Some of the removed branches. After a couple of days wiring. The tree will really benefit from a couple of years growth to fill out some areas such as the apex, but it now has a solid base structure to build upon further in the future. The graft in this trees case is quite noticeable at the moment but I think that once the white pines park begins to crackle it should start to blend in much more. How long will that take? Who knows. I think 10 years would start to see the process beginning. You don’t see many White pines in Australia and particularly of this size. It will be a good tree to keep an eye on as it progresses in the coming years. What are your thoughts for the apex at this stage ? Really enjoying your posts !how did your trees go at the convention ? The Apexes on both the smaller and larger trunks could do with some filling out. The structure is all there but it simply needs to do some growing to fill in a few light areas. the back branches in the crowns need to extend a bit to give a more solid look as well. My trees went well at the convention and they were in amongst good company as you can see from the gallery i posted earlier. Hopefully i will get time to post about my trees early next week. Probably late winter is the best time in your area. « AABC 2012 Exhibition Gallery.